May not be used in conjunction with any other specials. Valid at retail counter only. Toyotas only. 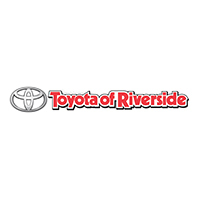 Coupon good only at Toyota of Riverside. Expires 4/30/19. Some models higher. Excludes Hybrid batteries. May not be used in conjunction with any other specials. Valid at retail counter only. Toyotas only. Coupon good only at Toyota of Riverside. Expires 1/2/19. Some vehicles slightly higher. Toyota vehicles only. Cannot be combined with any other specials. Excludes Catalytic Converters, TRD Products, 12 Volt Hybrid batteries, Bedliners and Accessories. Genuine Toyota parts only. Percent applies to total retail parts purchase, one per purchase. May not be used in conjunction with any other specials. Valid at retail counter only. Toyotas only. Coupon good only at Toyota of Riverside. Excludes Catalytic Converters, TRD Products, 12 Volt Hybrid batteries, Bedliners and Accessories. Genuine Toyota parts only. Percent applies to total retail parts purchase, one per purchase. May not be used in conjunction with any other specials. Valid at retail counter only. Toyotas only. Coupon good only at Toyota of Riverside. Expires 4/30/19.